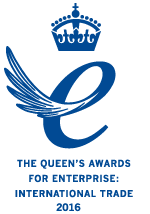 We are delighted and extremely proud to announce that the company has been selected to receive the UK’s most prestigious business accolade, a Queen’s Award for Enterprise 2016 – awarded in the International Trade category in recognition of our sustained and exceptional export growth which has exceeded 120% in the last three years. “Winning a Queen’s Award is a great honour for our company. We are absolutely delighted and extremely proud. Our long term strategy of investing in new technologies and developing innovative products and processes has been key. However, without the skill, dedication and hard work of our Daventry-based Design, Development and Production teams, the significant growth we have seen over the last three years would not have been possible. Thanks also has to go to HSBC and Northamptonshire Enterprise Partnership (NEP) who provided funding for some of our most important projects, and Loughborough University for our technology partnership. We produce extremely high quality, world leading products for our Original Equipment (OE) customers from our Northamptonshire UK base. We are particularly proud to be championing British industry in the heartland of German automotive manufacturing and look forward to continuing to improve and grow the business in the worldwide market. Red Arch will be invited to attend an exclusive Queen’s Award winner’s reception at Buckingham Palace. The Lord-Lieutenant of Northamptonshire will also visit the Red Arch Manufacturing facility in Daventry to present a crystal bowl in recognition of the achievement before the end of June.